some sonnets, or Australian bush poetry. or could you like the challenge of a villanelle. might write a limerick while riding in a tram. or can one narrative be like a marathon. and when you pen a lay, are they a piece of art? though, does romanticism want to make you scream. to name each one, is quite a challenge now for me. and learn the disciplines of how they all are done. attempt to write them all, becoming versatile. then, find your worldly niche - your own poetic voice. they won’t open their minds and let their thoughts be free. on poets and their styles or where it all began. for one day you will find, the poet deep within. David J Delaney was born and grew up in Australia. He has arrived in the literary world much later in his life. He confesses. ‘I only starting writing in late December, 2007’ and yet by now he has already published four books, won several awards and published in many anthologies worldwide. 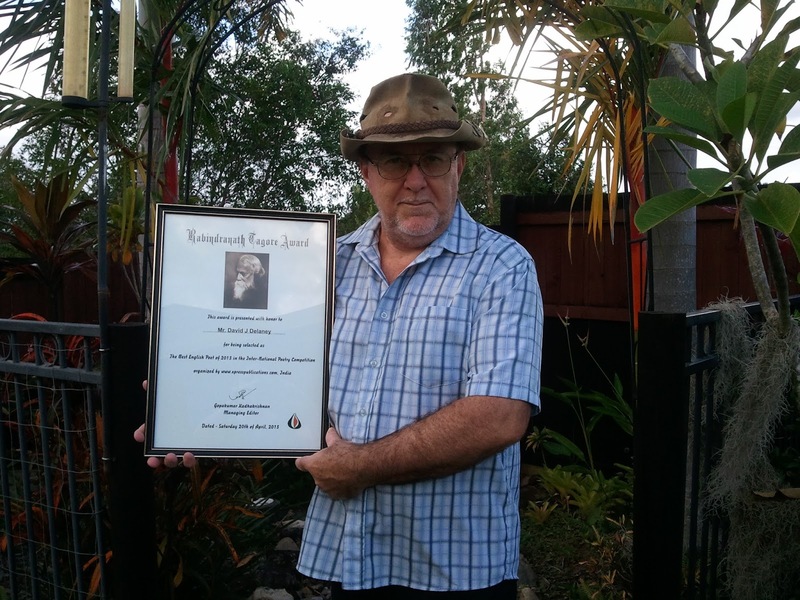 ‘As a poet, and recently a memoire/short story writer, ‘he admits ‘ I have had wonderful support, in Cairns, Queensland, Australia and worldwide. My love for writing and the impact it has on everyday people, has, definitely been an inspiration to me’. There is poignancy too in his poems. He is one of the voices urging the authorities to show empathy on the aborigines rather than hiding away, all while he suppresses his own grief. A man of many parts, he is now living a nomadic life and travelling in caravan. In this free-wheeling interview, he talks with me about his life, his poems and everyday people, social media impact and the future of poetry. Gopal Lahiri: Very briefly tell our readers about yourself? Your life as a poet? David J Delaney: I am in my mid sixties, married with 2 daughters & 6 grandchildren, my wife & I shunned suburbia in 2013 loving the nomadic life living & travelling in our caravan. My life as a poet started in 2007 & has been an amazing ride, before that I never would have thought I would be a international award winning, published poet & short story writer. What started you writing ? Does it come naturally to you? I once managed a vehicle radiator warehouse & it was very quiet this day, I thought of a trip I did when I used to drive trucks long distances & decided to put it down on paper which ended up in rhyming poetry form. yes it did & even more so now I have learnt many of the “formulas” that go with the many different styles of poetry. Are there any themes which particularly attract you as a poet? I love witting about military, real life & historical themes. Poetry is essentially a self-taught art form. Do you think if there was formal training it would help or harm? From what I have noticed it depends on who is teaching, I know of some academics that will not teach a certain form of poetry because they don’t like it & only teach a form they like thus not giving the student a choice. Who are your favorite authors? Tell us about the writers who have influenced you. This is a hard question as there are so many, the old greats, Petrarch's and Shakespeare's sonnets, Basho’s Haiku & Tanka. Lawson, Paterson, Boake etc. Australian bush poetry. So many wonderful past & modern poets from all over the world. You once wrote, ‘The release of my 1st book “My small book of poems” in May 2007 has been one incredible step for me.’ The size of my book was purposely done to gauge the reaction of the public.’ Can you elaborate? 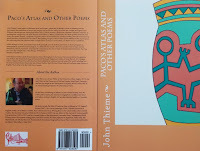 I was not sure how my early poetry would be accepted by the reading public so instead of spending a lot of money on a large book I decided on a small book to gauge the reaction, fortunately the reaction was fantastic. You are an accomplished poet in Australia and clarity is the hallmark of your write. How do you approach poetry? Well it depends, if the poem is historical I have to do more study & research than, say, a childhood memory. I often “mull” the information around in my head for days, sometimes weeks thinking of lines, stanzas, styles & formula before I start to put pen to paper, sometimes the style does not come to me until I start writing. You are a member of Tropical writers group, Cairns and Australian Bush Poets Association. Share your experiences with us. Since my wife & I started travelling I am no longer a member of these groups but I still visit their sites, when there I received wonderful support from Tropical Writers Inc. the critique & suggestions were invaluable while I was attending, the same with Australian Bush Poets. sent over to South Africa, to fight in England’s war. nevermore to walk their bush, or camp on golden sand. surviving searing heat or through the winter rains. surprising British officers who’d fought in many wars. stopped the bloody war between the Boers and British too. and spend their lives beneath Australia’s starry dome. they never would return because their skin was black. far from their families, where they would hunt and roam. with knowledge that their menfolk, and they will be apart. for all that I can say is.....shame Australia, shame. You know a few Indian poets and you are familiar also with their works. How do you relate with India and Indian English Poets? Like yourself, Gopakumar Radhakrishnan, Sarojini Naidu, Rabindrananth Tagore, Mahadevi Varma & many more, the poems of your landscapes, cities, villages & every day people resonate so well with my thoughts. Yes I do, social media today can have one’s writings read anywhere in the world & instantaneously, a writer could receive critique from any number of groups & can study different forms at any time. What does poetry mean to you? Where do you see it going in the future? I believe poetry is slowly gaining in popularity again & will remain so into the future. What is your thought on young poets who are trying to get their work noticed? Study different forms, styles & poets, take on board constructive critique, don’t be discouraged buy harsh criticism, enter competitions, believe in what you write & why you write. “Chasing a Butterfly” by Canadian poet, H. W. Bryce. I would love to see poets write naturally & from the heart, not write to impress some academic or lecturer with words & phrases the local people would never understand. while dying leaves drift gently to the ground. when ice will hang from barren trees abound. penned every scene for all the world to read. while for your love, my heart again will bleed. I hope I will survive this daily fight. though what I do, he could not see as right. My rifle, now replaces pencil lead. Thank you for this post. It is very informative. And thanks for the mention David J.Delaney. And I am enjoying your book Another Chapter, just now too. Congratulations for your placement and a wonderful interview.